We continue to believe that ongoing market correction is giving an opportunity to long term investors to invest in equities to reap good returns. While many retail investors are getting panic with the fall in stock prices day by day, we are happy considering the fact that stock market after a long time has gone through a significant correction and giving an opportunity to invest in high quality companies at lower prices. We are glad to inform you that our equity analysts have released the best investment opportunities from small and mid cap segment which can deliver excellent returns during next 5 years. 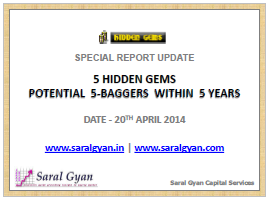 Our team has released 2nd Issue of Special Report 5 Stocks - Potential 5-Baggers in 5 Years with an objective to achieve average annualized returns of 38% each year to achieve 5-Bagger returns in period of next 5 years.